Quality going forward negates Donald Love's reoccurring mistake - Ethan's away days & player ratings! 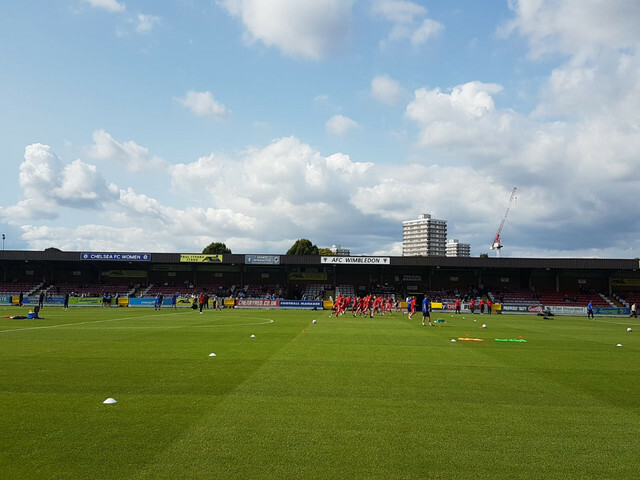 Sunderland made yet another long away trip this season, this time it was to South London and Kingsmeadow, home of Chelsea Ladies and, of course, AFC Wimbledon. Bryan Oviedo was back from a knock but only made the bench, as did Dylan McGeouch. We went down on the train from Newcastle and ended up going straight to the Miller’s at King’s Cross, after a breakfast from the Eat O’clock Cafe on Pentoville Road. After this, we headed over to Vauxhall where I bumped into Kevin Ball at the station; he was on club duty and was waiting for a train to Wimbledon too. After getting off at Norbiton, about a 20 minute walk from the ground, we bumped into a Swedish Wimbledon fan! He claimed he knew the area but ended up taking us 15 minutes in the wrong direction and it was Bally who pointed us in the right direction after bumping into him again! After eventually getting to the ground, detouring to the chippy just outside for some cheesy chips (chips with grated cheese on top – not proper ones!). 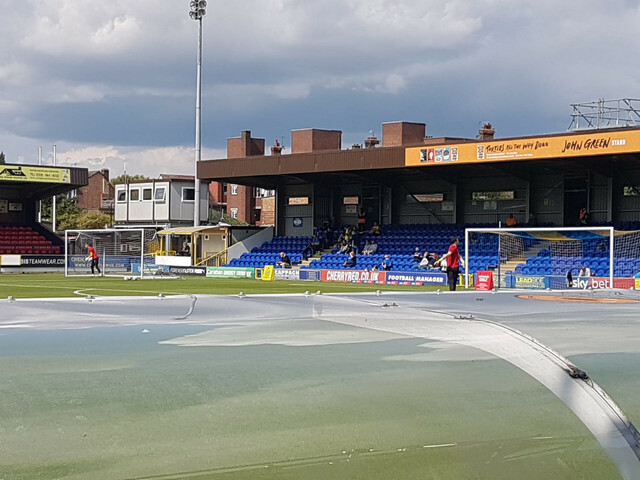 I wasn’t quite sure what to expect, scaffolding held up the away end and we had half of a standing terrace and a small seating area. As for the facilities, it was a porter cabin for toilets and a shed for refreshments! To be honest, first half we were battered, they are a massive team – every player looked over 6 feet tall, Joe Pigott and James Hanson up front have a combined height of 12.3 ft. They beat us all ends up for strength and physicality. It was the Dons who took a deserved lead when Pigott vollyed in Andy Barcham’s cross past the helpless Jon McLaughlin. Donald Love was again poor and allowed a free cross into the area, something that would become a recurring theme. Sunderland never looked like scoring first half but the one thing that was observed was that Wimbledon couldn’t cope when we played football rather than pumping it long. Most of the fans there may have thought a point would’ve been a good result considering the way we’d played thus far. Sunderland did equalise through the unlikely goalscorer of Lee Cattermole. A corner ball was swung into the box and Cattermole’s header forced a save from King, but the rebound fell back to the long serving midfielder who stabbed it into the empty net from close range. As the away end celebrated the linesman had appeared to have called the ref over and they were discussing what I can only think to have been an offside – anyway the goal was given and the party continued. The visitors then took the lead through Cattermole again - he hardly scores in 9 years then two in the space of half an hour! After some great work down the right between skipper George Honeyman and Lynden Gooch, the Californian crossed it to be met by the foot of Boro born Catts, who swiftly struck his volley into the ground and past King. The whole away end went up and some even took it upon themselves to climb onto the advertising boards and smack the top of the stand, someone was even put through the perspex in the Sunderland dug out! First thing I’d like to mention, the linesman on the flank nearest to the away fans was atrocious and the referee wasn’t much better - very much home officials, despite the penalty claims being waved away. Also, I’ve slated Lee Cattermole for some time now, however that was one of his best performances. Personally, I’ve never been a fan of him – last good, full season was with Lorik Cana and possibly the Wembley season. Still think he can improve his game but he could be a top player in this league if he actually puts a shift in and doesn’t just stand there pointing and shouting. McLaughlin: 7 – didn’t need to do much and couldn’t do much about the goal. Love: 4 – poor again, beaten far too easily for the goal and lost every physical battle. Loovens (Ozturk '46): 4 – assume he was subbed off due to an injury at half time. Baldwin: 6 – got bullied by Hanson at times but dealt with any danger reasonably well. James (Oviedo '59): 5 - was beaten physically but seems quick. Power (McGeouch ’52): 6 – looked quality, as ever, until he went off injured. Cattermole: 9 – was excellent, despite my recent criticism of him, second goal a striker’s finish too. Honeyman: 6 – done nowt impressive apart from a one two with Gooch for Cattermole’s second. Maguire: 8 - ran after everything, chased everything down and will square up to anyone regardless if they’re a foot an a half taller. What we’ve needed for a while. Gooch: 7 – made some decent runs and a great ball in for Catts’ second. Maja: 7 – done well considering who he was up against, especially holding the ball. Ozturk: 3 – air kicked about 3 times which nearly cost us but others pulled him out of it. Oviedo: 7 – game completely changed when he came on, this league is way below his level, if he actually wants to play here and commits himself. McGeouch: 6 – controlled the midfield when he came on despite a few lazy passes. Again, we didn’t play well but shows a good team who can still win like this. Three big home games now and hopefully keep up the unbeaten start. Share your thoughts on Twitter with me @ethan_thoburn or @WeAreWearside and thanks for reading.